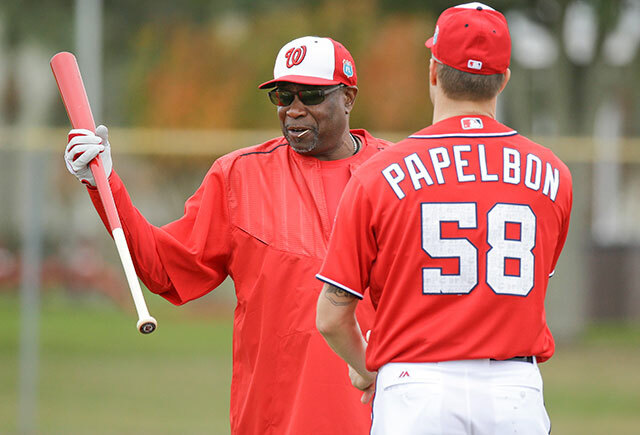 It's spring training time for the National League East, where Cliff Corcoran breaks down the big change, big question and big prospect for each team as camps open. This week from Monday through Wednesday, SI.com baseball experts Cliff Corcoran and Jay Jaffe will break down what to watch for in each team's camp as part of our spring training preview by looking at the Big Change, Big Question and Big Prospect for all 30 clubs. Teams are listed by their order of finish from 2014. Note: The Big Prospect is a player who will be in big-league camp this spring but has not yet debuted in the major leagues. Today's preview: the National League East. A year ago, Matt Harvey hadn’t pitched in a major league game in more than a full season; Noah Syndergaard, Steven Matz and Michael Conforto were minor leaguers with unknown arrival dates; Yoenis Cespedes was a Tiger; and the Mets were a team whose return to contention was still believed to lurk somewhere beyond the 2015 season. Meanwhile, the division rival Nationals were considered the best team in baseball. A mere year later, Washington is licking its wounds from a disastrous season and has lost starter Jordan Zimmermann, shortstop Ian Desmond (we assume, as he's still a free agent as of this writing) and centerfielder Denard Span to free agency. New York, meanwhile, is counting on full, productive seasons from all five of the players mentioned above and, coming off its first pennant since 2000, arrives in camp as division favorites. The Big Question: How will the team’s young starters respond to last year’s innings increases? All of the hand-wringing and he-said/he-said about Harvey’s innings total last year wasn’t about 2015; it was about '16 and beyond. Despite being advised to limit Harvey to 180 frames in his first season after Tommy John surgery, the Mets wound up using him for 216 innings between the regular season and playoffs due to their unexpected postseason run. That was an increase of 37 2/3 innings from his previous career high in 2013—and that after he didn’t throw a single competitive pitch in '14. Harvey wasn't alone in pushing his limits: Jacob deGrom surpassed his career-high innings total by 37 1/3 as a sophomore, and Syndergaard saw a 65 2/3-inning increase from his career high. Will there be a hangover effect? We may not get the answer in camp, but pay attention to the velocity and control of those three pitchers—not necessarily where they start in early March, but where they finish. Pitchers use camp to build strength and work out kinks, but if any one of those three isn’t up to speed by the end of the exhibition schedule or is having uncharacteristic control issues, there will be good cause for concern. The No. 11 pick in 2013 and the Florida State League's Most Valuable Player last year in his age-20 season, Smith is a top-100 prospect (Baseball America: 79; Baseball Prospectus: 86; MLB.com: 51) due to open this season in Double A. Smith isn’t a classic slugging first baseman but is more of the athletic model—the average-sized, slick-fielding contact hitter with doubles power. The big question is how much power he’ll add as he matures, as scouts think there’s potential for significant pop in his bat. Smith won’t turn 21 until mid-June, but Mets fans can get a sneak peak in major league camp this spring, where he’ll be wearing No. 74. Try to catch his batting practice for a glimpse at that power potential. Williams, whose managerial experience prior to taking over as Washington’s skipper in 2014 consisted of five weeks as an interim manager in Double A in '07 and one season in the Arizona Fall League, crossed the line from strong and stoic to incommunicative in his second year on the job. Baker may not be Tony La Russa in the dugout, but one thing that the gregarious 66-year-old won’t be is overwhelmed by the interpersonal aspects of the job. Baker has 20 seasons as a major league manager under under his belt, and the change in the tenor of the clubhouse should be immediately evident this spring. The Big Question: How close is Trea Turner to ready? Desmond could still technically return to the Nationals, but Washington has already anointed his successor in Turner. The 13th pick in the 2014 draft out of NC State by the Padres, Turner was acquired when the Nationals brilliantly inserted themselves into the trade that sent outfielder Wil Myers from the Rays to San Diego. In his first full professional season, Turner hit .322/.370/.458 with 29 stolen bases in a season split between Double and Triple A, making his major league debut in late August. Turner didn’t hit much in that brief look and is expected to open this season in Triple A as Danny Espinosa keeps the shortstop position warm, but as soon as the team believes he’s ready, he’ll be back up to push Espinosa to the bench. For now, look for Turner to split time with Espinosa at shortstop in camp, and pay attention to how he performs against pitchers expected to make their respective teams’ Opening Day rosters. Who is the best pitching prospect in baseball? Giolito (BA: 5; BP: 3; MLB: 3) is the popular answer to that question, and he arrives in major league camp for the first time just as the Nationals’ heralded rotation is starting to disperse, with Zimmermann having signed with Detroit this winter and Stephen Strasburg entering his walk year. The Nationals have taken it slow with the 16th pick of the 2012 draft since his Tommy John surgery that August, but Giolito forced his way to Double A late last July and could be up by midseason this year. Big, powerful and talented, Giolito has true ace potential, but he is likely to be limited to 150 innings this season. Hopefully we’ll get plenty of opportunities to watch him follow his upper-90s heat with a filthy 12–6 curveball this spring. 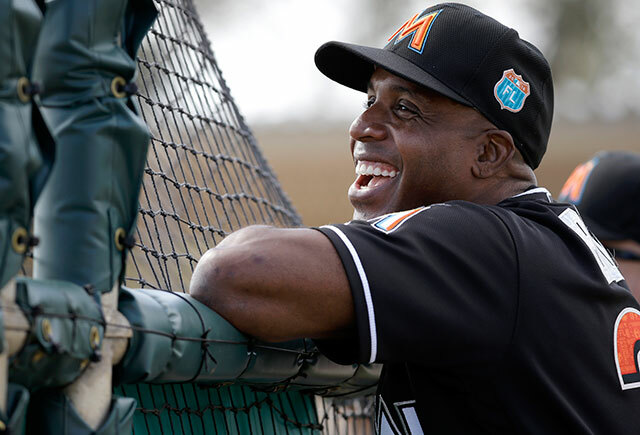 The Marlins hired a new manager this winter in former Dodgers skipper Don Mattingly, but the more compelling change is the arrival of a new hitting coach: a fellow by the name of Barry Bonds. Inarguably one of the greatest hitters in the game’s history, Bonds served as a spring training instructor for the Giants in each of the last two years and has worked with individual players from other teams on his own time. This will be his first time full-time job in the majors, however, since he was effectively blackballed from the game after reaching free agency after the 2007 season. It also marks the first time Bonds has stepped outside the safety of the Giants’ organization since he signed with the team in December 1992. The Marlins have no shortage of compelling young hitters who could benefit from Bonds’s vast knowledge of the craft, not to mention Mattingly’s, but both Bonds’s ability to communicate with those players and his ability to keep the relatively low profile typical of a major league coach remain to be seen. Mattingly has some experience with having an infamous superstar as a hitting coach, having worked with Mark McGwire for the last three years with the Dodgers. McGwire spent three years as the Cardinals’ hitting coach before that, however, and he came clean about his steroid use with a press release and a televised hour-long interview with Bob Costas a month before reporting to his first spring training with St. Louis. In doing so, McGwire answered the lingering questions about his playing career, preempting any such questions from the media once he was back in uniform. Bonds has done no such thing and will now have to face the media on a regular basis while holding a leadership role. The Big Question: Is Giancarlo Stanton healthy? When Stanton broke the hamate bone in his left hand last June, he was expected to miss four to six weeks. Hamate injuries are fairly common among hitters, typically occurring in the bottom hand due to contact with the knob of the bat, and because the bone is inessential, the treatment is to have it surgically removed. The timeframe for return is well established and usually averages around six weeks. Pablo Sandoval, a switch-hitter, broke the hamate in each of his hands while with the Giants and missed 45 days the first time and 37 days the second. Troy Tulowitzki missed 39 days in 2010, Michael Brantley was out for 37 days in '11, Nick Markakis missed 40 days in '12, and so on. Stanton broke his hamate on June 26 of last season, so he should have been back on the field in early August. Instead, he missed the final 100 days of the season as he struggled to regain strength in his left hand, which built up an excessive amount of scar tissue. ​Hamate surgery is not supposed to be career-altering. David Ortiz had it in 1998 while still with the Twins. Ken Griffey Jr. and Jim Thome both had it in 1996 and combined for 96 home runs the next year. Dustin Pedroia had it after the 2007 season and won the American League’s Most Valuable Player award in '08. Still, the Marlins and their fans won’t be able to move past Stanton’s injury until they see him in camp lifting weights, catching flies and, most importantly, gripping and ripping at the plate with that bottom power hand at full strength. The Marlins are one of two teams (along with the Angels) not to have a single prospect on the top 100 lists recently released by Baseball America, Baseball Prospectus or MLB.com. Of the team’s consensus top three prospects, first-ranked Tyler Kolek (a pitcher) and first baseman Josh Naylor (ranked second by BA and BP) were drafted in 2014 and '15, respectively, and are not among the team’s non-roster invitees to camp. Garcia, ranked No. 2 on MLB.com’s list and No. 3 by BA and BP, is in camp—though as you might expect, he’s not that compelling. Added to the 40-man roster in November to avoid exposure to the Rule 5 draft, Garcia will be in camp almost by default. A skinny 23-year-old lefty starter from the Dominican Republic with a three-quarters delivery and a fastball that can spike into the mid-90s, Garcia lacks an impressive secondary pitch and would seem to have a mid-rotation ceiling. Watch his curve and changeup this spring to see if he has made any improvement with either pitch, as well as his control, which wavered last year after his late-July promotion to Double A. The Braves’ rebuild began more than a year ago, when the team traded rightfielder Jason Heyward, leftfielder Justin Upton and catcher Evan Gattis, but fans knew their time with Heyward and Upton was likely limited given that both entering their walk year. Gattis wasn’t as significant a loss, and the subsequent trade of closer Craig Kimbrel didn’t occur until after Atlanta had departed spring training for its season-opening series against the Marlins in Miami. The departure of Simmons, who was traded to the Angles in November, is likely to be felt far more acutely by the Braves’ faithful, as well as by the rest of the team, particularly the pitchers. Simmons is widely considered the best fielder in baseball at any position. What's more, he is just 26 and was under contract for five more years with a bargain 2016 salary of $6 million. 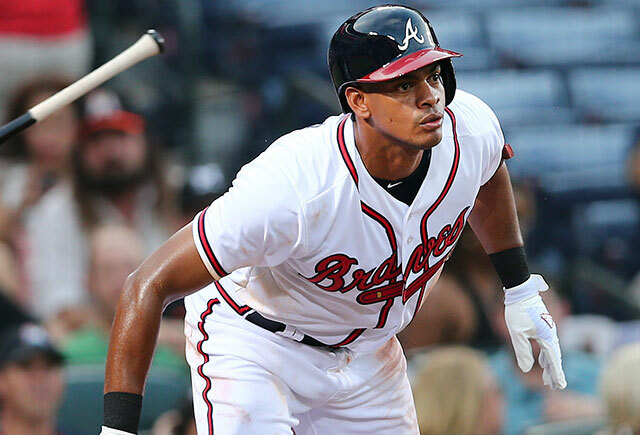 There was no expectation that he would be traded, and his absence will be glaring both this spring and this season given his central position on the diamond and the dramatic gap between his abilities in the field and those of his 32-year-old replacement, Erick Aybar. The Big Question: Can Hector Olivera be the team’s leftfielder? Olivera was the principal player acquired last July in the trade of second base prospect Jose Peraza, lefty starter Alex Wood and lefty reliever Luis Avilan, among others, to the Dodgers in a complicated three-team deal. A Cuban defector who will turn 31 in early April, Olivera was primarily a second baseman in Cuba but played third base exclusively in his first major league exposure last September and will be moved to the outfield this spring. That move to the far left of the defensive spectrum increases the pressure on Olivera to provide value with his bat, which remains unproven in the United States; he hit a combined .265/.320/.387 in 222 plate appearances across just 35 minor-league games and 24 major league games. On top of that, Olivera has almost no experience in the outfield beyond three games in the Puerto Rican Winter League this off-season and arrived in the U.S. with significant concerns about the health of his right (throwing) elbow; his contract actually contains a $1 million option for 2021 should he require Tommy John surgery prior to that season. The Braves owe Olivera $32.5 million for the next five seasons, and finding out exactly what they are going to get for that money—not to mention Peraza, four years of Wood and three years of Avilan—starts this spring. The Braves didn’t invite Swanson to major league camp this spring merely to show off their big off-season acquisition or to appease fans who are upset that they traded Simmons. The No. 1 pick in last year’s draft, Swanson was acquired from the Diamondbacks in December’s Shelby Miller trade and is expected to progress quickly through the minors; Baseball America believes he could reach the majors this year, possibly even before rosters expand in September. Baseball Prospectus’ 2018 ETA seems more likely to me, but we are talking about a true blue-chip prospect (BA: 17; BP: 27; MLB: 8) drafted out of Vanderbilt University who turned 22 earlier this month and hit .289/.394/.482 in 99 plate appearances in low A ball in his first professional exposure last summer. Swanson has refined skills and could indeed move quickly, but I’d be surprised if he stuck around in major league camp very long this spring, so be sure to catch him early in the exhibition schedule. The Phillies arrive in camp this year as an almost entirely new organization. They have a new front office, a new team president in Andy MacPhail, a new general manager in Matt Klentak and a relatively new manager in Pete Mackanin, who shed the interim tag he acquired in replacing Ryne Sandberg last June. More importantly, Philadelphia is finally not only rebuilding, but also doing so successfully. 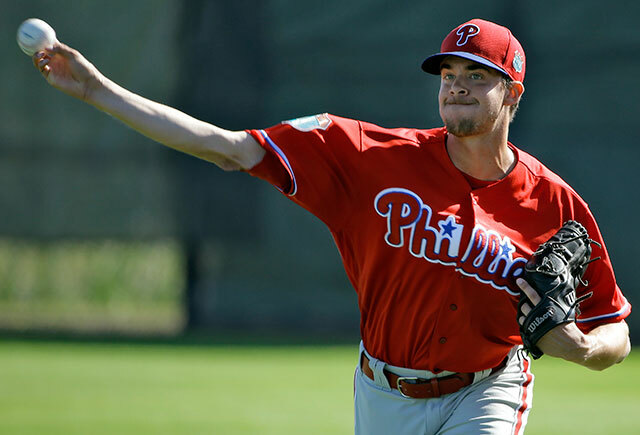 The 2016 Phillies won’t be a good team, but the young talent they’ll have in camp this year hints at how good they could be before the end of the decade and just how quickly they might be able to return to contention. Among the top-100 prospects in camp: shortstop J.P. Crawford (more on him below), outfielders Nick Williams (BA: 27; BP: 25; MLB: 64) and Roman Quinn (MLB: 99), catchers Jorge Alfaro (BP: 70, MLB: 96) and Andrew Knapp (BA: 96) and righthanders Jake Thompson (BA: 75, BP: 34, MLB: 55) and Mark Appel (BP: 64, MLB: 70). Those prospects are seeking to join an emerging core led by third baseman Maikel Franco (who slugged .497 in 335 plate appearances as a rookie last year) and righty Aaron Nola (3.59 ERA, 3.58 strikeout-to-walk ratio in his first 13 major league starts), both of whom are entering their age-23 seasons, and supplemented by recent trade acquisitions such as righties Jerad Eickhoff and Vince Velasquez. The Phillies lost 99 games last year for the first time since 1969, but that collection of talent suggests that the organization has finally turned the corner toward the next winning team. The Big Question: What did the Phillies get in Mark Appel? Of all of those talented young players, Appel, who was acquired in Philadelphia's trade of closer Ken Giles to Houston, is the biggest question mark. The No. 1 pick in the 2013 draft, Appel proved to be a source of frustration and contention in the Astros’ organization. His raw talent is undeniable, and he has the build (a solid 6’5”) and the stuff (mid-90s fastball, slider, change, two-seamer) of a future ace, but he has yet to get the results that profile would suggest. In parts of three minor-league seasons, he has a 5.12 ERA, 1.44 WHIP and a weak 2.63 strikeout-to-walk ratio and wasn’t much better than those numbers in a 2015 season split between Double and Triple A (4.37 ERA, 1.41 WHIP, 2.16 strikeout-to-walk ratio). Those numbers haven’t motivated his rise to the upper minors, which was the source of the contention in Houston in 2014. Having delayed his professional debut by a year by refusing to sign when the Pirates drafted him out of Stanford University in 2012, Appel will turn 25 this July, giving some sense of urgency to his development. Clearly, the Astros ran out of leash for the Houston native, so it’s now up to the Phillies to figure out if they can salvage his promise and make him a front-of-the-rotation starter in the major leagues. The second-best prospect in the division after Giolito, Crawford (BA: 6; BP: 4; MLB: 5) is exactly 11 months younger than Swanson and is far more likely to force his way to the majors in the second half of the season. Drafted with the No. 16 pick in 2013 out of Lakewood (Calif.) High School, Crawford reached Double A in late May of last year and hit a respectable .265/.354/.407 in 405 plate appearances at that level. A five-tool shortstop, he’s an outstanding defender with speed who can hit and get on base and could reach double digits in home runs as he matures (he hit 11 in 2014, his age-19 season, in which he topped out at high A ball). He is the centerpiece of the Phillies' rebuilding effort and should get a long look in camp.